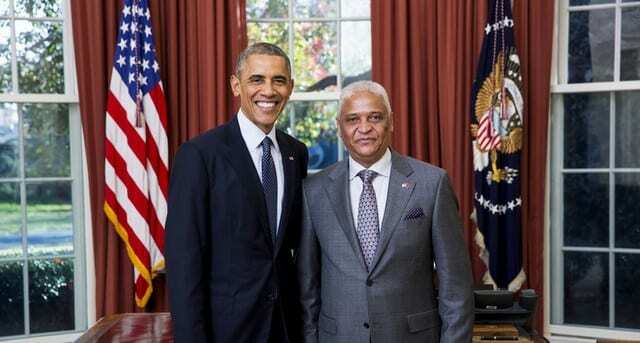 Ambassador Agostinho Tavares da Silva Neto presented his credentials to president Barack Obama at the White House, in Washington, D.C. on November 18, 2014, becoming the 5th Angolan Ambassador to the US. Ambassador Agostinho Tavares da Silva Neto joined the Angolan Ministry of Foreign Affairs in March 1977 at the Directorate for Cooperation and Economic Affairs. Subsequently the Directorate of Cooperation and Economic Affairs became Secretary of State for Cooperation in 1978 and he assumed the leadership of the Human Resources Department. Ambassador Agostinho Tavares da Silva Neto was born in Luanda on January 16, 1954, earns a Bachelor Degree in International Relations at the University Center of Brasilia, Brazil. He is a member of the Career of the Angolan Foreign Affairs Ministry and was appointed in August 24, 2014 by President José Eduardo dos Santos to lead the Diplomatic Mission in Washington, D.C., with the main purpose of improving relations between Angola and the US. Prior to this appointment, he served as Ambassador of Angola to Canada (2011- 2014). Ambassador Agostinho Tavares da Silva Neto, is married to Mrs. Prudência de Sousa Carneiro da Silva and has five children. He is fluent in Portuguese, English and Spanish.